increase in mortality during the fall migration? The authors of three recent papers dealing with the decline in monarch numbers at the overwintering sites in Mexico have proposed that the decline is due to increased mortality during the migration or the establishment of the overwintering population (Badgett and Davis, 2015, Inamine, et al., 2016, Ries, et al., 2015). While Ries, et al. (2015) suggest that increased mortality during the migration could account for the decline, they acknowledge that other factors could be involved. Badgett and Davis (2015) are more certain of this interpretation, to quote – “we interpret the disconnect between the size of the migratory cohort at Peninsula Point and the overwintering population to be the result of mortality incurred during the migratory journey”. Similarly, from Inamine, et al. (2016) “our results are consistent with failed migration or re-establishment at the overwintering grounds impacting the population decline in Mexico.” These statements are nothing more than speculation, and no data are offered in these papers in support of this supposition. Reviewers of these manuscripts and editors of the respective journals should have challenged these unsupported statements, particularly since this speculation is used in the papers by Badgett and Davis (2015) and Inamine et al. (2016) to challenge the view, well supported by data, that the loss of milkweed and breeding habitat is the cause of the monarch decline. Unfortunately, unsupported claims have a way of becoming facts (especially in press releases and news reports). Decisions with regard to monarch conservation should be based on data and not on unsupported speculation. This brings us to the question: Are there data that support or refute the supposition that mortality during the migration has increased over the last decade? Our tagging data are relevant to this question. Because this text is written as a blog article, we will start with a brief summary of the results followed by a discussion. The sections that follow include background information on the tagging program along with a discussion of the dynamics of tag recovery and a section dealing with the analysis. For those interested in a quick read, we suggest reading the summary together with a scan of Figures 1-3. This text is being rewritten for publication. The following analysis is based on tags applied to the wings of over 1.2 million monarchs over an 18-year period. 1) A significant positive association exists between the numbers of monarchs tagged each fall and the sizes of the subsequent overwintering populations (Figure 1). The tagging represents both a broad sampling area and an extended time period and, as such, is a more realistic measure of the population than population estimates obtained at peninsulas and regionally-limited butterfly counts. The migratory population is tagged over much of the area east of the Rockies (Figure 2). Tagging is conducted annually for a 2.5-month period as the migration progresses toward Mexico. 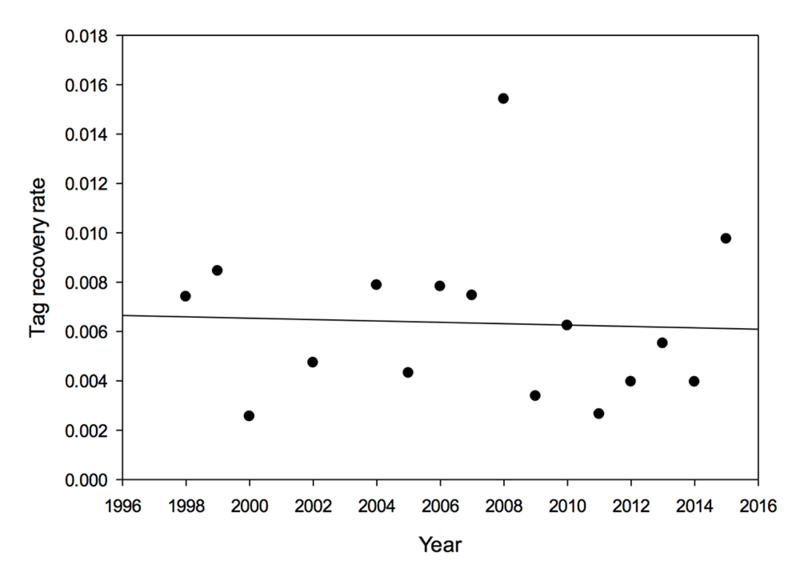 2) The data from 1998 to 2015 show no systematic decline in the proportion of tags recovered each year (Figure 3). Number of people searching for tags. 4) The tagging data are strongly correlated with the number of hectares of overwintering monarchs. This relationship establishes that there is no “disconnect” between late summer and overwintering populations. In contrast, the data sets used by Badgett and Davis (2015), Inamine, et al., (2016), and Ries, et al., (2015), which represent a small monarch source population (Peninsula Point, MI) and regionally-limited butterfly counts (OH and IL), are not correlated with overwintering numbers. Given the tagging results, it’s clear that the data sets used by these authors are inadequate measures of the late summer and migratory monarch populations. It follows that the conclusions, and speculations, based on these data are unjustified. Figure 2. 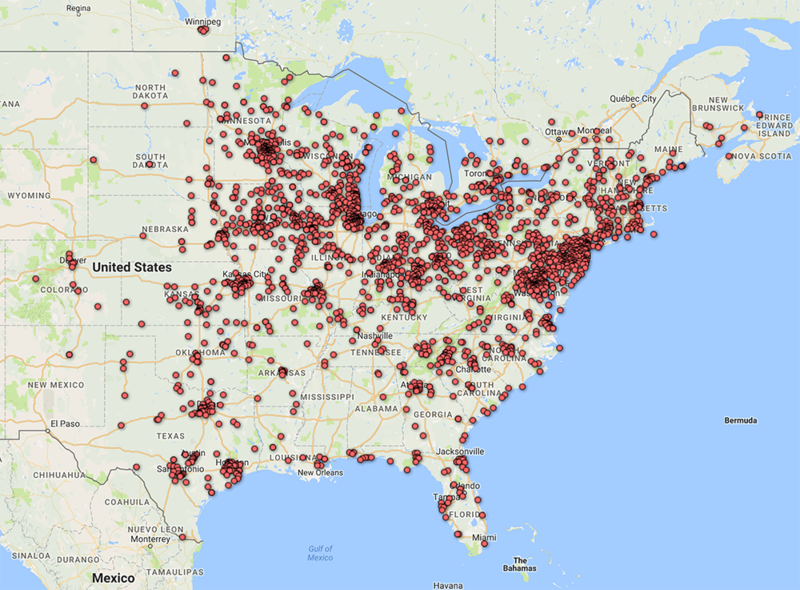 Distribution of >220,000 monarch tags to >2250 recipients in 2015. The data sets and analysis used by Badgett and Davis (2015), Inamine, et al. (2016) led them to conclude that there is a disconnect between the year to year numbers recorded by observers at Peninsula Point, MI (Badgett and Davis, 2015) or NABA summer butterfly counts (Inamine, et al, 2016) and overwintering numbers. “Disconnect” refers to the fact that neither count predicted or was correlated with the overwintering numbers. Failure to find the expected connection led the authors of both papers to speculate that the reason for the decline had to lie with increasing mortality during the migration. No data were offered in either paper in support of this speculation. The idea that mortality has increased during the period of the decline, roughly from 2005 to the present, is not supported by the tagging data. 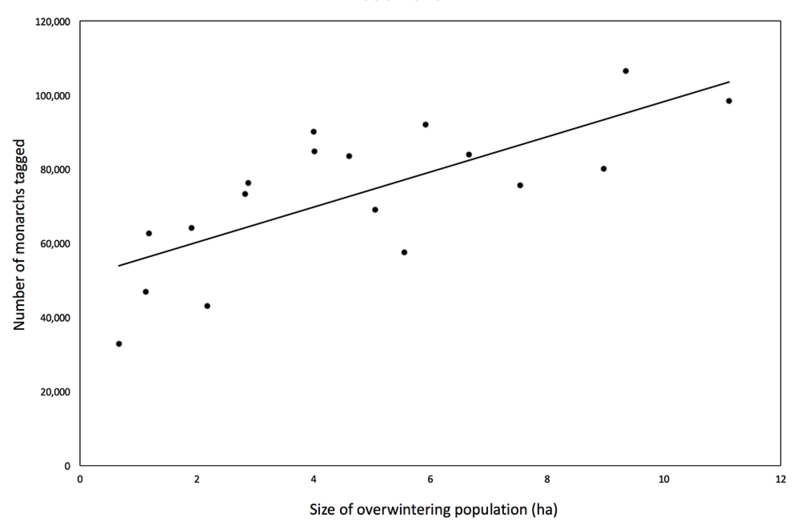 The numbers of monarchs tagged each year are strongly correlated with the size of the overwintering populations, R² = 0.5476, p = 0.0004 (Figure 1). These data constitute direct evidence that the size of the late summer monarch population is related to the size of the overwintering population. In contrast to data cited by Badgett and Davis (2015) for Peninsula Point, a relatively small source area representing western Ontario and the Upper Peninsula of MI and the NABA summer butterfly counts from Ohio and Illinois analyzed by Inamine et al., (2016) and previously by Ries, et al., (2015), the tagging represents sampling of the population over much of the area east of the Rockies as the monarch migration progresses southward over a 2.5-month period from mid-August to November (Figure 2). In this analysis we’ve made a distinction between the total number of tags recovered from those tagged in a given year and the rate (percentage/proportion) of recovery of all tags applied in a given year, the latter being the total recovered divided by the total number tagged. The total recoveries are positively related to the total hectares of monarchs reported in each year as well as the total area occupied by monarchs at El Rosario. This result is expected since recovery is likely a function of the proximity of tagged monarchs to a population of searchers. Analysis of the rates of recovery of tags shows that there was no significant change in the rate of recovery from 1998 through 2015 (Figure 3). This result indicates that mortality during the migration has not increased over the last 18 years. Given the lack of evidence of an increase in mortality during the migration, the question becomes: How can we account for the so-called disconnect between the data from Peninsula Point (Badgett and Davis, 2015) and the midsummer NABA butterfly counts (Inamine, et al. 2016, Ries, et al. 2015) and the overwintering numbers reported in Mexico? The authors in each case accepted the respective data bases as representative of the larger population in spite of a substantial body of evidence defining the loss of milkweeds in row crops and the loss of milkweed-containing habitat in the Upper Midwest, the area known to produce most of the monarchs that reach Mexico, as the major causes of the monarch decline (Faber, S., et al., 2012, Flockhart D. T. T., et.al., 2015, Hartzler, R. G. 2010, Lark, T.J., et al., 2015, Pleasants, J. M. and Oberhauser, K. S. 2013, Wassenaar, L. I. and Hobson, K. A. 1998, Wright, C. K. and Wimberly, M. C. 2013). Wouldn’t it be wiser to reverse the questions in each case and ask why the Peninsula Point and NABA data are out of sync with the larger data sets on monarchs, milkweeds and habitat loss, since the data representing these factors are strongly correlated with the size of the overwintering population in Mexico? The expectation that population counts on peninsulas or from specific regions of the breeding range should correlate with the overwintering numbers in Mexico rests on the assumption that the conditions that lead to the establishment and development of the breeding population each year are uniform for all regions of the country. That assumption simply isn’t true. Recolonization and climate vary sufficiently across the breeding range within and among years to account for the so-called disconnect between population assessments from limited areas and the overwintering numbers (Saunders, et al. 2016). Stated another way, the timing of colonization across the northern breeding range and the biotic and physical factors the growing populations experience result in regional differences in the production of monarchs. We need to integrate these regional differences in population development to fully understand the year to year numbers in the fall migration. Further, we need to know the relative contribution of monarchs originating in each region to the overwintering population. The tagging data speak to that point as well but that will come later. The interpretations of the data sets used by these authors have already been challenged (Brower, et al., 2012, Pleasants, et al., 2016). The results of the tagging analysis lend support to the views articulated in these earlier papers that the data from peninsulas (Badgett and Davis, 2015, Davis, A. K. 2011,) and regionally-limited butterfly counts (Inamine et al., 2016, Ries et al., 2015) are not representative of late summer monarch populations. Each year we issue monarch tagging kits to taggers broadly distributed east of the Rockies. The distribution of those receiving tags in 2015 is shown in Figure 2. Taggers are asked to return their data sheets. The date, location and person tagging each butterfly is logged into a database. Creating the database is a significant task since we receive 2000-5000 data sheets per year. Each tag bears an individual code and the codes are carefully matched to the tagger and the data on returned data sheets. Some taggers fail to return their data sheets with the result that 5-10% of the recovered tags cannot be associated with the date and location of tagging. These data are discarded. The failure to return data sheets also means that the number of monarchs we record as tagged each year is an underestimate. With few exceptions, tags are applied to migratory monarchs from early August to November. Most monarchs are tagged within the “migration window” for each latitude. The migration window is a 30-day period roughly corresponding to a 10-degree shift in the altitude angle (sun angle) of the sun at noon from 57-47 degrees. The leading edge of the migration usually arrives at each latitude close to an altitude angle of 57-56 with nearly all monarchs passing through a particular location when the altitude angle reaches 47 degrees (Taylor and Gibo, unpublished data). In this data set, the numbers tagged per year varied from 106,564 (2001) to 32,667 (2013). As the migration moves S and SW, we are informed of low numbers of sightings and recoveries of tagged butterflies. We will deal with these “domestic” recoveries at a later date. This analysis is limited to the recoveries at the overwintering sites in Mexico. Monarchs usually begin arriving at the overwintering sites in the last few days of October. Conspicuous colonies form by mid-November with tourism beginning at about the same time. Most tags are recovered from dead monarchs found beneath the colonies by guides and ejido members, including children. We estimate that there are 10-40k untagged butterflies for every one that is tagged. Because of the ratio of untagged to tagged, the search time to find a tag typically involves hours of shuffling through dead butterflies to find a single tag. Due to the effort required to find each tag (estimated to be 2-4 hours) and to reward those who recover tags, we purchase tags from guides and residents in late winter each year. Those with tags save them in the hope that they will be present when Monarch Watch (MW) representatives show up to buy tags. Some residents hold on to tags for many years until they have the opportunity to sell them. As a result of this dynamic, there is a long lag in tag recovery. Most tags applied in a given year are recovered over the next 4-5 years. However, it is not uncommon for MW representatives to be offered tags that were applied to fall migrants >10 years earlier. Two tags applied in 2001 and one from 2002 were purchased this past winter. Because of the lag in recoveries, it is likely that more tags will be recovered for the monarchs tagged during the past five seasons (2011-2015). These additional recoveries will change the slopes of the graphs presented here but will not change the conclusions derived from these data. Similarly, as we continue to clean up this massive data set, it is likely that some numbers will change. Again, there is no reason to expect that such changes will alter the interpretations presented here. Our tagging program evolved over the years. We started the program in 1992 and used the “alar” tags pioneered by Fred and Nora Urquhart. This method proved to be too difficult for many taggers and resulted in many broken wings. Over the next four years, we used rectangular tags that were applied with glue to the underside of a monarch’s hind wing. This method was also unsatisfactory and, in 1997, we developed the technology (a special adhesive and tool to cut the tags) to produce the circular tags used in most tagging programs today. The circular tags resulted in a substantial increase in recoveries. Although the number of tags recovered for a given year is related to the overall size of the population and to the area the colony occupies at El Rosario, other factors certainly contribute to the rate of recovery. It is likely that survival during the migration is both higher and lower than normal in particular years resulting in either greater or fewer tags at risk of being recovered. Similarly, it’s probable that mortality during the winter is both higher or lower than normal in specific winters, resulting in either higher or lower tag recovery. There are also day to day dynamics and seasonal changes as monarchs seek water or colonies shift in location, both of which can result in off-site mortality where tags are not likely to be found. Other site issues include the density of the understory, with denser cover limiting the ability to spot tags. There are human dynamics as well that include the accessibility of the colonies to the searchers, the shifting population of searchers due to the turnover in guides, the overall number of searchers and the economic conditions that motivate the searchers. Nevertheless, in spite of these sources of variance in the recovery rates, there are no patterns in the data suggestive of a significant decline in mortality during the migration. The summaries presented here deal with all records of circular tags applied during the migration as well as tags subsequently acquired in Mexico from 1998 – 2015, exclusive of 2001 and 2003. Circular tags were first used in 1997, and though we began purchasing tags during that year, residents had no advance information, and searching for tags was therefore somewhat limited in the winter of 97-98. The winter of 97-98 was also one of great contrasts, with a freezing event at Chincua that resulted in a small area with dead monarchs said to be two feet in depth to an abandonment of colony sites late in the winter as water sources dried up as a consequence of the extreme drought brought on by the El Niño of that year (Monarch Watch Season Summary 1997, p29). The abandonment of the colony site at El Rosario likely resulted in off-site mortality and lower than expected recovery rates. We excluded 1997 from the analysis for these reasons. The data from the 2001 and 2003 seasons were also excluded from the analysis since severe storms resulted in the deaths of roughly 70% of the monarchs each winter (Brower, et al., 2004, Taylor, 2004). Over 3626 tags were recovered following the January storm in 2002 with 3416 recovered following the storms of early 2004. The records from 1998-2015 represent 14,209 recoveries of more than 1.2 million tagged for an overall recovery rate of 1.18%. We wish to thank Eligio García, Eduardo Rendón, and Lincoln Brower for assistance in locating the reports detailing the number of hectares occupied by monarch each year at El Rosario. Long conversations with John Pleasants helped to clarify statistical issues and how to present the data. We are indebted to Diane Pruden, Debbie Jackson, Gail Morris, Carol Pasternak, Janis Lentz, Sarah Schmidt, Dana Wilfong, Cathy Walters, David Kust and family, and many, many others who helped purchase tags. We are most appreciative of the many donors who have contributed to the tag recovery fund over the years. Hundreds of tags have been purchased by visitors to the overwintering sites and donated to Monarch Watch. Numerous staff members and students have logged and/or managed the data over the last two decades, and recently we have been aided by many volunteers in the process of verifying the records and formatting the data for entry into a larger database. And last, but not least, we wish to thank the tens of thousands of taggers who have so enthusiastically contributed to this project since 1992. Badgett, G. and Davis, A. K. 2015. Population trends of monarchs at a northern monitoring site: analyses of 19 years of fall migration counts at Peninsula Point, MI. Ann. Entomol. Soc. Am. DOI: 10.1093/aesa/sav060: sav060. Brower, L. P., D. R. Kust, E. Rendón-Salinas, E. García-Serrano, K. R. Kust, J. Miller, C. Fernandez del Rey, and K. Pape. 2004. Catastrophic winter storm mortality of monarch butterflies during January 2002, pp. 151–166. In K. S. Oberhauser and M. J. Solensky (eds. ), The monarch butterfly: Biology and conservation. Cornell University Press, Ithaca, NY. Brower, L. P., et al. 2012. Response to Davis: choosing relevant evidence to assess monarch population trends. Insect Conservation and Diversity 5: 327-329. Faber, S., Rundquist, S. & Male, T. (2012) Plowed Under: How crop subsidies contribute to massive habitat losses. Environmental Working Group report. Flockhart D. T. T., Pichancourt, J. B., Norris, D. R. & Martin T. G. (2015) Unraveling the annual cycle in a migratory animal: breeding-season habitat loss drives declines of monarch butterflies. Journal of Animal Ecology, 84, 155-165. Inamine, H., Ellner, S. P., Springer, J. P. and Agrawal, A. 2016. Linking the continental migratory cycle of the monarch butterfly to understand its population decline. Oikos 000:001–011, doi: 10.1111/oik.03196. Monarch Watch Season Summary 1997. p 29. Pleasants, J. M. and Oberhauser, K. S. 2013. Milkweed loss in agricultural fields because of herbicide use: effect on the monarch butterfly population. – Insect Conservation and Diversity 6: 135-144. Pleasants, J. M., Williams, E. H., Brower, L. P., Oberhauser, K. S. and Taylor, O. R. 2016. Conclusion of no decline in summer monarch population not supported. Annals of the Entomological Society of America. DOI: http://dx.doi.org/10.1093/aesa/sav115. Ries, L., D. J. Taron, and E. Rendón-Salinas. 2015. The disconnect between summer and winter monarch trends for the eastern migratory population: Possible links to differing drivers. Ann. Entomol. Soc. Am. 108: 691–699. Stenoien,C., Nail, K., Oberhauser, K. S. 2015. Habitat productivity and temporal patterns of monarch butterfly egg densities in the Eastern U.S. Ann. Entomol. Soc. Am. 108: 670-679. Taylor, O. R. 2004. Status of the population. Monarch Watch Email Updates. March 2004. http://www.monarchwatch.org/update/2004/0318.html#4. Accessed 4 July 2016. Wassenaar, L. I. and Hobson, K. A. 1998. Natal origins of migratory monarch butterflies at wintering colonies in Mexico: new isotopic evidence. Proceedings of the National Academy of Sciences 95: 15436- 15439. Wright, C. K. & Wimberly, M. C. 2013. Recent land use change in the Western Corn Belt threatens grasslands and wetlands. Proc. Natl. Acad. Sci. USA 1104, 134–9. The Inamine et al. (2016) paper was published online in April. The papers below include additional data and analysis that support the hypothesis that the monarch decline is the result of a loss of habitat. Pleasants, J. 2016. Milkweed restoration in the Midwest for monarch butterfly recovery: estimates of milkweeds lost, milkweeds remaining and milkweeds that must be added to increase the monarch population. Insect Conservation and Diversity (2016) doi: 10.1111/icad.12198. Stenoien, C., Nail, K., Zalucki, J. M., Parry, H., Oberhauser, K. S., and Zalucki, M. P. 2016. Monarchs in decline: A collateral landscape level effect of modern agriculture. Insect Science. doi: 10.1111/1744-7917.12404. You may download this text as a PDF file.